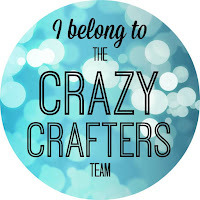 Play along with the Creative Crew Challenges to get those creative juices flowing! 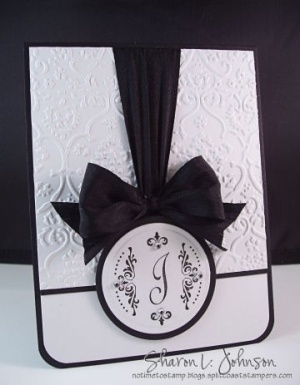 A food or family Scrapbook Page, table favours, signs etc! I made a Curvy Keepsake Box with Perfect Plum cardstock, which I stamped with Versamark using the A World of Thanks stamp. The leaf is made with the Vintage Leaves stamp set and matching Leaflets Framelits. 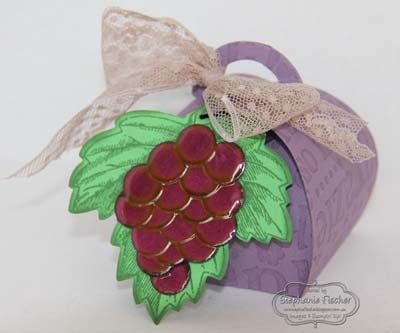 The grapes are lots of 1/2" circles punched from Rich Razzleberry cardstock and edged with Blackberry Bliss. These are overlapped and stuck together to form a bunch on top of the leaf and I gave them a coating of Crystal Effects for shine. I stuck my bunch of grapes to the box and finished it off with a bow of Tip Top Taupe Dotted Lace Ribbon. 1st July - Creative flavour day, how creative can you get with icecream? 23 July - The ice cream cone's birthday. It was invented in 1904, so the ice cream cone is 111 years old this year! The ice cream cone is stamped onto Whisper White cardstock and coloured (I used the new thicker version because it stands up to watercolouring so well). The cone is Crushed Curry and Delightful Dijon. The ice cream flavours are Chocolate Chip, Watermelon Wonder and Mint Macaron. The cherry is (rather appropriately) Cherry Cobbler with a coat of Crystal Effects for shine. 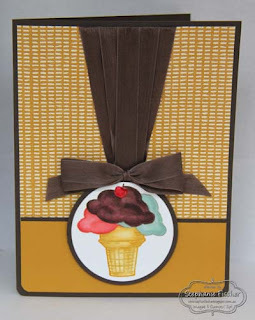 The base cardstock is Early Espresso with panels of Delightful Dijon and Bohemian DSP. The ribbon is Early Espresso Seam Binding. 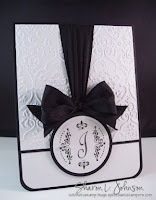 I was inspired by this card by Sharon L Johnson.